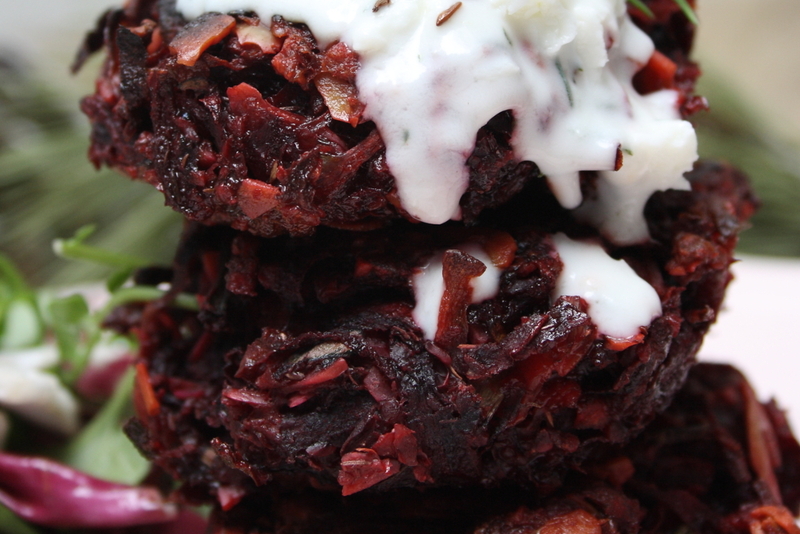 Finnish Beetroot Fritters, My Version. Makes the World Taste Good. pop quiz: the lyric above is from what song and artist? clue: an original rat-packer takes on a wonky lyric. For a vegetarian, two weeks skiing in Finland was a bit of a daunting prospect. I needn’t have worried; the cooks at Torrespieppi and Yllas Ski Resort, where we stayed, went out of their way to make us something delicious every evening. If I had one criticism, it would be that they seemed to have a glut of beetroot, as beetroot fritters appeared on my plate several times; it’s a good job I liked them. I’ve no idea what their recipe was, but from looking at a few online and testing a few myself, this is the simplest, most tasty version I’ve come up with. Coarsely grate the beetroot into a bowl. Use an electric grater/chopper if you have one, if you are doing it manually; use gloves. Squeeze and discard (or drink!) the excess juice. Add the flour/oats, seeds, egg, onion and cumin to the beetroot and mix thoroughly. Cover the bowl and pop it in the fridge for at least an hour. Divide the mixture into about 6 and shape each handful into a fritter shape. Roll each one in the ground rice/fine semolina. This will help you shape the fritters and create a nice crispy coating on the fritter. Heat a splash of cooking oil in a non-stick pan over a medium heat. Fry each fritter for about 5 minutes on side one, turn over and fry side two for about 3 minutes – you are looking for a crispy coating on each side. If you are using cooked beetroot, that’s it. If you like a good crunch in your beetroot, that’s it. But, if you are using raw beetroot and you prefer your fritters softer; place them on a baking tray in a 180o oven for about 15minutes. A good traditional accompaniment is horseradish – a tsp of horseradish sauce mixed with a tbsp of crème fraiche works a treat. Goats’ cheese is also an excellent flavour combination for beetroot; serve fritters with baby green leaves and a few chunks of goats’ cheese and, if you fancy, a small handful of chopped walnuts. pop trivia: ‘The Candy Man’ was originally written for and featured in the 1971 version of ‘Willy Wonka and the Chocolate Factory. However the track became a signature tune for Sammy Davis Jr after it became a hit for him in 1972. Exercise; Love it, Hate it. Sport; Love it, Hate it. Piparkakku (Gingerbread Cookies): Traditional Food from Lapland. Thank you for joining the Piste Maps mailing list. We have sent a confirmation link to the email you entered. Please click the link to confirm you wish to join us. We will send you an email about every two weeks and will not share your data with anyone else. If you don't receive our email, please check your spam or junk folder. An error occurred when we tried to add you to our mailing list. Please try again! This email address already exists in our records! You should already receive our newsletters, if not, please check your spam or junk folder. First Effect websites use ‘cookies’ to help deliver you a personalised online experience. A cookie is a text file that is placed on your hard disk by a web server. Cookies cannot be used to run programs or deliver viruses to your computer. Cookies are uniquely assigned to you, and can only be read by a web server in the domain that issued the cookie to you. One of the primary purposes of cookies is to save you time. The purpose of a cookie is to tell the web server that you have returned to a specific page. You have the ability to accept or decline cookies. Most web browsers automatically accept cookies, but you can usually modify your browser setting to decline cookies if you prefer. If you choose to decline cookies, you may not be able to fully experience the interactive features of any First Effect website you visit. Strictly Necessary Cookie is enabled so that your preference for other cookie settings are saved. You cannot disable this. If you are not OK with this, please do not continue to use our website. Through a Google Analytics Account, First Effect collects anonymous demographic information. This information is not unique to you, such as postcode, age, gender, preferences, interests and favourites. Google Analytics also records information about your computer hardware and software. This information can include: your IP address, browser type, domain names, access times and referring website addresses. We use this information for the analysis of our service, to maintain quality of the service, and to provide general statistics regarding use of the First Effect website. We retain data in our Analytics account for 26 months. Please enable Strictly Necessary Cookie first so that we can save your preferences!